Guangdong province faces the South China Sea, separated from the northern provinces by the Southern Mountain Range. While dotted with a few inactive volcanoes, Guandong does have a number of powerful rivers going through it. Many cities in fact have built themselves near one of the major bodies of water in the province, the Pearl River Delta which is where three upstream rivers converge. A multicultural province, the majority of the population is made up of Cantonese speakers. Its economic and political industries are run on this dialect and the region’s cuisine is predominantly Cantonese. Guandong’s minorities include the Yao, Li, Zhuan and Miao groups. Guandong is China’s 4th most populated province, with over 110 million people residing in its busy towns. Its economic boom has brought a large inpouring of migrants from neighbouring provinces. At the same time, Guandong is the home province of a huge number of Chinese overseas workers. Many of the US railroad workers during the 19th century, for example, came from Guandong, as do large numbers of Southeast Asian Chinese. Guandong was China’s first province to adopt the Open Door Policy. Prior to 1978, Guandong was mostly agricultural. The Guandong of today has changed dramatically; its cities have become highly developed, with standards of living at par with the other advanced provinces of China. 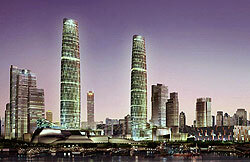 Its capital city, Guangzhou, is one of China’s rising economic powerhouses. 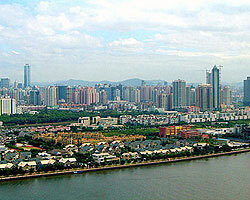 Its other major zity, Shenzhen, is also a very successful economic centre. Guandong’s winters are mild, dry and short, its summers wet, long and hot. Guangzhou is sometimes referred to as the South Gate of China, as it is near the South China Sea and one of the closer provinces to Hong Kong and Macau. As the Pearl River runs through it, it can be navigated into from the sea. Guangzhou is Guangdong Province’s greatest city, its economic, educational, political and cultural centre, bursting with potential. One of the first Chinese cities to open to the world, thousands of workers from other regions flocked to Guangzhou for a piece of the action. The traffic has not been one-way. 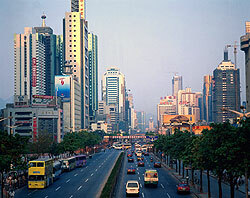 Guangzhou can attribute some of its success to the large number of locals who moved overseas to work. Many brought back skills and money, established educational institutions, opened up international markets, and connected Guangzhou to the world. Once known to non-Chinese as Canton, Guangzhou‘s history spans three Chinese dynasties. The visitor’s first stop in Guangzhou should be at the Sun Yat-Sen Memorial Hall, where he can learn about Guangzhou’s 2000-year-old history. After this crash course, there are Buddhist temples, imperial tombs and big museums to visit. Those looking to get away from the noise of the city might choose the large and quiet Yuexiu Park instead. Guangzhou’s shopping districts and entertainment centres are always abuzz with activity, day and night. The city’s residents seem to party as hard as they work, and seem forever restless and on the move, always in a rush to get to where they’re going. The Haizhu District, south of the Pearl River, is one of Guangzhou’s leading business areas, particularly in trading and real estate. It is close to downtown Guangzhou, but less crowded than districts like Yuexiu and Liwan. Haizhu also hosts some important establishments, like Sun Yat-Sen University, the Pearl River Promenade, and the Canton Fair Pazhou Exhibition Centre. Property in Haizhu is relatively pricey. The best locations are the riverfront residential buildings. The Tianhe District is relatively new, but this is where much of the action happens. Monumental structures such as the Tianhe Sports Centre, impressive skyscrapers such as the Citic Plaza, and new residential towns like Zhujian New Town are constantly being developed in Tianhe District. The first large project in the area was the Sports Centre, built in the early 1980s, a massive compound which includes not only an indoor swimming pool and a gymnasium, but a stadium seating 65,000 people. Shortly after this more rice fields were sacrificed in the name of progress, and in the mid-80s small areas called the “xiaoqu” sprouted. Buildings in these “smaller districts” were uniform in size and shape: residential low-rises no more than 10 storeys high, each floor having four units. Any more units would have required the installation of elevators, and raised construction costs. Each xiaoqu had an average of 20 buildings. The xiaoqus became gradually smaller as land become pricier. As the district developed, it also attracted better-funded developers, who built higher. The new residential compounds now being built consist of four to six buildings, with 30-floor high-rises. Once a dense forest, Zengcheng is now a well-developed district, with modern living conveniences and a great transport network. It has a solid reputation for strong industries such as automobile parts and accessories, jeans and other garment manufacturing. Along with the development of the district’s economy has come an increase in the value of property investments. Large real estate companies have opted to construct more residential areas here, for the working men and women of Guangzhou. While not a tourist hotspot, should you find yourself in the area, drop by the communities near the rivers. This is where you can see Guangzhou locals going about their day-to-day business, as they have done for centuries past.